WHO : On the great toe, medial to the distal phalanx, 0.1 F-cun proximal-medial to the medial corner of the toenail, at the intersection of the vertical line of the medial border and horizontal line of the base of the toenail. 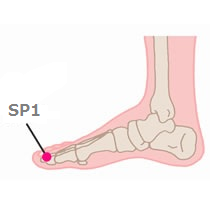 Practical : For alternative SP-1, bend the big toe, get a point at the end of the line, immediate effects on tonsillitis with moxa. WHO : On the great toe, in the depression distal to the first metatarsophalangeal joint, at the border between the red and white flesh. WHO : On the medial aspect of the foot, in the depression proximal to the first etatarsophalangeal joint, at the border between the red and white flesh. WHO : On the medial aspect of the foot, anteroinferior to the base of the first metatarsal bone, at the border between the red and white flesh. 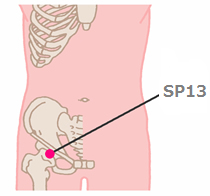 Note: A depression can be felt when moving proximally from SP3. 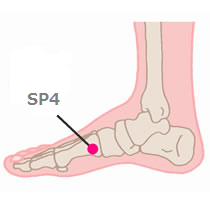 SP4 is located in the depression distal to the base of the first metatarsal bone. WHO : On the medial aspect of the foot, anteroinferior to the medial malleolus, in the depression midway between the tuberosity of the navicular bone and the prominence of the medial malleolus. 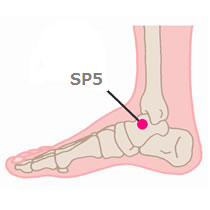 Note 1: SP5 is located at the intersection of two imaginary lines: the vertical line of the anterior border of the medial malleolus and the horizontal line of the inferior border of the medial malleolus. 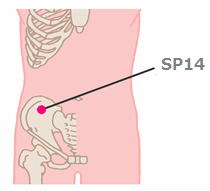 Note 2: SP5 is located posterior to LR4 and anterior to KI6. WHO : On the tibial aspect of the leg, posterior to the medial border of the tibia, 3 B-cun superior to the prominence of the medial malleolus. Note: 1 B-cun superior to KI8. 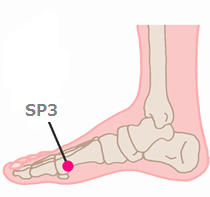 Practical : Four fingers up from top of the medial malleolus. 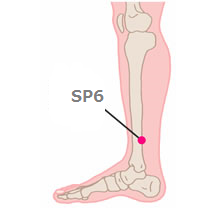 WHO : On the tibial aspect of the leg, posterior to the medial border of the tibia, 6 B-cun superior to the prominence of the medial malleolus. Note: 3 B-cun superior to SP6. 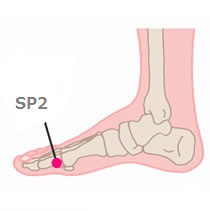 Practical : Four fingers from SP-6. 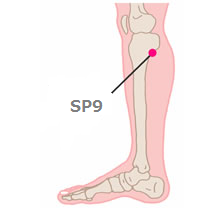 WHO : On the tibial aspect of the leg, posterior to the medial border of the tibia, 3 B-cun inferior to SP9. 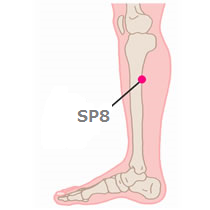 Note: SP8 is located at the junction of the upper one third and lower two thirds of the line connecting the apex of the patella with the prominence of the medial malleolus. WHO : On the tibial aspect of the leg, in the depression between the inferior border of the medial condyle of the tibia and the medial border of the tibia. 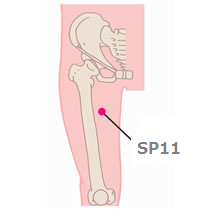 Note: A depression can be felt inferior to the knee joint when moving proximally along the medial border of the tibia. 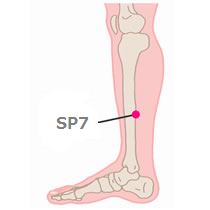 SP9 is located in a depression at the angle formed by the inferior border of the medial condyle of the tibia and the posterior border of the tibia. 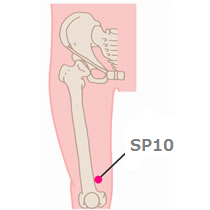 Practical : Slide up the inside edge of tibia by index finger. The finger would be automatically stop. 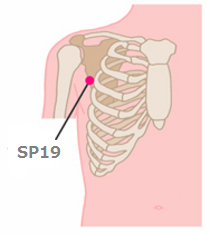 This point will be SP9. WHO : On the anteromedial aspect of the thigh, on the bulge of the vastus medialis muscle, 2 B-cun superior to the medial end of the base of the patella. 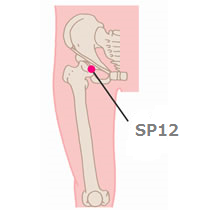 WHO : On the medial aspect of the thigh, at the junction of the upper one third and lower two thirds of the line connecting the medial end of the base of the patella with SP12, between the sartorius muscle and the adductor longus muscle, over the femoral artery. WHO : In the groin region, at the inguinal crease, lateral to the femoral artery. 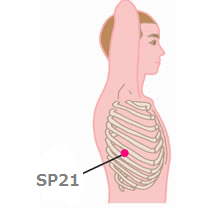 Note: At the same level as CV2, medial and inferior to SP13. WHO : On the lower abdomen, 4.3 B-cun inferior to the centre of the umbilicus, 4 B-cun lateral to the anterior median line. WHO : On the lower abdomen, 1.3 B-cun inferior to the centre of the umbilicus, 4 B-cun lateral to the anterior median line. Practical : Two fingers down from SP-15. WHO : On the upper abdomen, 4 B-cun lateral to the centre of the umbilicus. Note: At the same level and lateral to ST25, KI16 and CV8. Practical : 4.5 fingers outside of Navel. WHO : On the upper abdomen, 3 B-cun superior to the centre of the umbilicus, 4 B-cun lateral to the anterior median line. Note: 3 B-cun superior to SP15, at the same level as CV11. WHO : In the anterior thoracic region, in the fifth intercostal space, 6 B-cun lateral to the anterior median line. 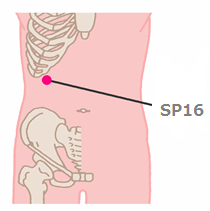 Note: SP17, ST18 and KI22 are located along the curve of the fifth intercostal space. WHO : In the anterior thoracic region, in the fourth intercostal space, 6 B-cun lateral to the anterior median line. 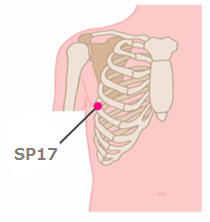 Note: SP18, ST17 and KI23 are located along the curve of the fourth intercostal space. WHO : In the anterior thoracic region, in the third intercostal space, 6 B-cun lateral to the anterior median line. 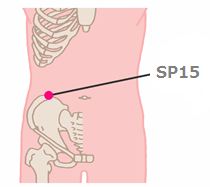 Note: SP19, ST6 and KI24 are located along the curve of the third intercostal space. WHO : In the anterior thoracic region, in the second intercostal space, 6 B-cun lateral to the anterior median line. 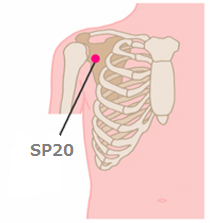 Note: SP20, ST15 and KI25 are located along the curve of the second intercostal space. 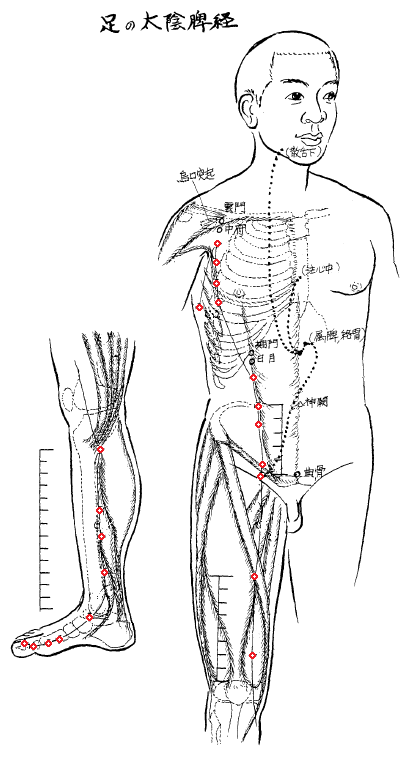 WHO : In the lateral thoracic region, in the sixth intercostal space, on the midaxillary line. 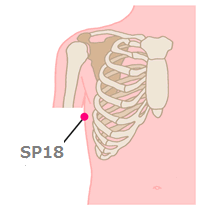 Note: With the subject lying on the side and the arm abducted, SP21 is located at the intersection of the midaxillary line and the sixth intercostal space.